You just signed a lease for a new apartment. Congrats! While you're popping champagne & packing up your life, you may be thinking of what you need for your new space. It's easy to get overwhelmed when thinking of EVERYTHING you need. Try thinking of one room at a time to keep it simple. We've put together a little checklist of items to consider when making your new living room feel like Home! Lighting is one of the top factors in helping a room feel "cozy". You don't have to purchase matching lamps, in fact it's more fun when you find lamps of different shapes & sizes! We recommend finding 1-2 lamps to help make a living room feel complete. Bonus: Floor lamps don't require end tables. End tables are great for lamps (as mentioned above), and keeping coffee or wine close by - but don't forget coasters! Depending on the end table, they can also double as extra storage space. We recommend at least one for a living room. If your apartment has wood flooring, having a rug will give your living room the pop & comfort it needs. Rugs are an easy way to add a statement to a room without too much effort. A typical rule of thumb when purchasing an area rug, is to find one 2 feet shorter than the smallest wall in the room. If you're looking for a quick & budget-friendly way to add color and texture to a room, shop for a few throw pillows! We recommend finding a few throw pillows in various patterns with a similar color scheme for your couch & chairs. Another tip: Find one awesome pillow and use it as a color swatch for the rest of the room! Curtains, blankets and rugs can be coordinated all with one pillow in mind. An easy and fun way to add color to your space! Knick knacks add character to a room. 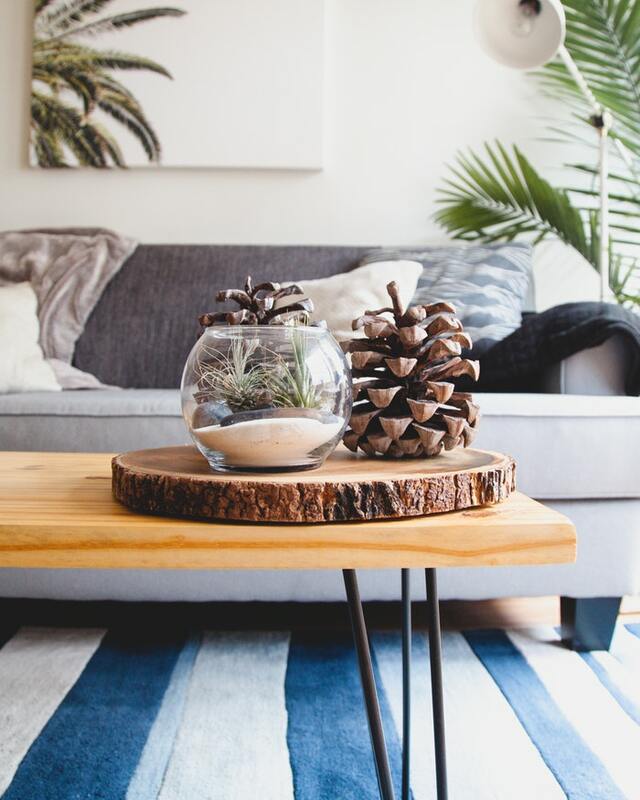 Pop some of your favorite books on a coffee table or bookshelf, add a few plants to give some height or place some candles around the room. We recommend finding a tray for a coffee table as your spot for storing remotes and beverage coasters. Dress it up with a plant and picture frame! Whether you sink into your recliner to watch Netflix, or flop onto your couch after a long day, having a throw close by will make it easy to settle in. We recommend placing 2-3 throws on the end of couch arms or over recliners for a cozy convenience. A large blanket basket is also a great room staple if you don't want to keep them on the furniture. A great conversation starter, wall art can also add character to a room and make the space feel like yours. Frame your favorite lyrics, quotes and photos, or find a unique piece that speaks to you.